The latest piece in an ongoing series exploring a language of curvilinear and spiral motifs. 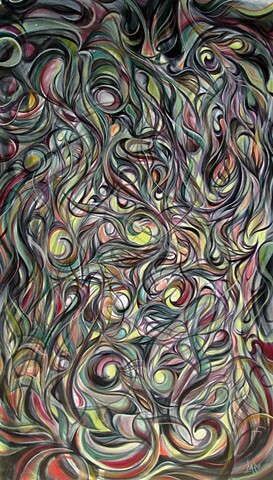 The painting is about fluidity, about gravity as relative. about movement in all directions. Painting to the edge the ever-expanding space is one for meditation and contemplation through color and form that loosely referencing an organic source.